A 74-year-old Maine man retraces the journey of his pioneering, 19-year-old great-great-grandfather, who left his home in Canada in 1845. For all the ways to see the film, including information on DVD purchases, please visit the See The Film page. For news and press, please see below. APRIL 2019 UPDATES: If you would like to follow along on current projects from Portland, Maine-based Home Ice Productions, please stop by our sister websites, www.mainebicentennial.com (Maine stories, features, news, events and resource links for Maine’s 200th) and www.shapeoflove.me (the new documentary film in production). In the Spring of 1845, 19 year-old Israel Shevenell set out on foot from his home in Compton, Quebec to find work. He found it as a brickmaker in Biddeford, Maine, nearly 200 miles away. He became the city's first permanent French-Canadian settler. Photo courtesy of McArthur Public Library. In 2015, his great-great grandson, Ray, retraced his pioneering steps. His great-great-great granddaughter, Tonya, tells their stories in The Home Road documentary film. There are more than 2 million descendants of French-Canadian immigrants living in New England and this podcast is a new conversation ground for stories. The episodes are hosted by Jesse Martineau or Mike Campbell and you can hear them on the podcast’s official website www.fclpodcast.com or on Apple, Spotify, Sound Cloud Stitcher, Google Play Music, Castbox and other sites. The Home Road documentary film and journey is the subject of an upcoming episode to be recorded this month. As soon as we have a broadcast date, we’ll post it, but in the meantime, check out the first episodes with guests, Tim Beaulieu, trustee at the Franco-American Centre in Manchester, NH and the event organizer of New Hampshire Poutine Fest and writer Juliana L’Heureux. Great news! Maine Public will rebroadcast The Home Road on Thursday night, April 4th at 10 pm and again on Saturday morning, April 6th at 11 am. 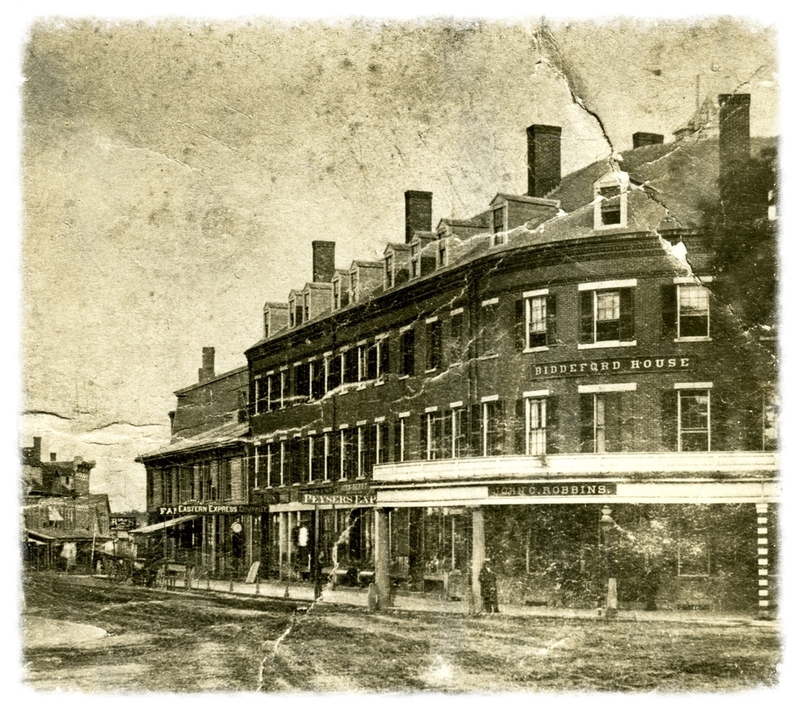 That week 174 years ago in the Spring of 1845, 19-year-old Israel Shevenell left his home in Canada and walked 200 miles to Biddeford, Maine to find work. His grandson, Ray Shevenell retraced the pioneering journey in 2015 at the age of 74. Watch the film on Maine Public to see the story. To see a trailer of the film, click here. The Home Road will be screened as part of the Maine Woodland Owners’ annual meeting and Forestry Forum, part of the Agricultural Trades Show at the Augusta Civic Center on January 16th. The event is open to the public so if you are attending, please join Tonya and Ray for the movie and a Q&A! Join Ray for a film screening and Q&A as part of the Cape Elizabeth Community Services Lunch ‘n Learn event on Tuesday, February 19 at 11:30 am at the High School cafeteria. Visit See The Film page for more info. Tuesday, October 16 - South Berwick Public Library in South Berwick ME 7 pm Free to public! We continue screening events for The Home Road this month in York and Aroostook Counties. Dad and I are pleased to be a part of the "Making Migration Visible: Traces, Tracks & Pathways" roster of events with our screening in Presque Isle on Thursday, September 20th. I'm happy to report that Dad and I will be able to travel to a few more parts of Maine for community screenings/Q&A's of the Home Road, thanks in part to a grant from the Maine Arts Commission. These extra screenings are being held in the coming months and we are excited to be able to bring the film to parts of the State we've not yet traveled. On the road again...the father-daughter team heads to the ocean and the mountains this month for screening and Q&A events! Join us at the beautiful Stonington Opera House on Thursday, July 12 as we help them tee off their Maine film series or come to Rangeley the following Thursday, July 19 as we present The Home Road at the Lakeside Theater. August finds us in Jonesport, Belfast and Greene! Summer road trips in Maine make us happy! For a schedule of screening events, see, the See The Film page. I'm excited to be part of the Emerge Film Festival in Lewiston, Maine on Saturday afternoon, April 28th at 1 pm as a contributor on one of the Making It In Maine Filmmaker panels! To learn more about the Film Festival and for a schedule of events, visit the website at Emerge! Spring 2018 - Join Tonya and Ray for live screening and discussion events at the following locations! For a list of prior screening events and locations, please scroll down to bottom of page. For more 2018 screening events, visit See The Film page. Winter 2018 - The Home Road will be on Maine Public Television in February! Tune in on Thursday evening, February 1st at 10 pm or Saturday morning, February 3rd at 11 am to watch the film in its entirety (76 minutes). Thank you to Maine Public Community Films for the good news! Kim Block from WGME in Portland, Maine met with Tonya and Ray in downtown Biddeford's Shevenell Park and produced a story for her "Making A Difference" segment. Check out the video of our time together HERE! Thank you Kim and Nate! It was a pleasure to be part of News Center Maine's popular program, 207, joining hosts Rob Caldwell and Amanda Hill - live! - to talk about The Home Road! See the segment HERE. "The Home Road: A Cape Elizabeth man retraces the journey of his pioneering great-great grandfather" by Marta Girouard. Read the article on page 7 of the Cape Courier HERE. From Le Forum, published by the Franco-American Centre at the University of Maine at Orono - Winter 2018 edition (Vol 39, No.4) Review by Patrick Lacroix Read the review by visiting the link and scrolling down to page 41 HERE. From the Lincoln County News. "Portland filmmaker's 'The Home Road' Celebrates Migration, Tenacity" Review by Christine LaPado-Breglia. Read the review HERE. Thank you to these venues and their wonderful audiences! From Sunday, May 31st through Friday, June 12th, 2015, Ray Shevenell walked 188 miles from the rolling countrysides and tree farms of Quebec's Eastern Townships and the Coaticook River Valley, through the majestic White Mountain National Forest in New Hampshire, through western Maine woods, to a city by the ocean where Israel Shevenell made home. To get a sense for the experience along the trek..
Visit the Tumblr blog Tonya created along the way for day-to-day highlights and photos as the trek unfolded! Israel Shevenell made additional trips back to his home in Quebec, convincing his parents and siblings to move to Biddeford. Ray Shevenell turns up a lot of turf walking and weeding (a zest for hiking and agriculture runs through the family!) around his passion for trains. The Heart of Biddeford organization has done beautiful work to help reimagine great public spaces. Tonya Shevenell looks forward to producing her first documentary film this year and to bringing discoveries made along the way to big and little screens!